Oh, her eyes, her eyes make the stars look like they're not shining. Her hair, her hair falls perfectly without her tryin. She's so beautiful. And I tell her everyday. Opened my eyes, and it was only just a dream. There's not a thing that I would change. Cause you're amazing, just the way you are. 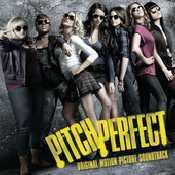 - Álbum "Pitch Perfect" del año (2013)	.